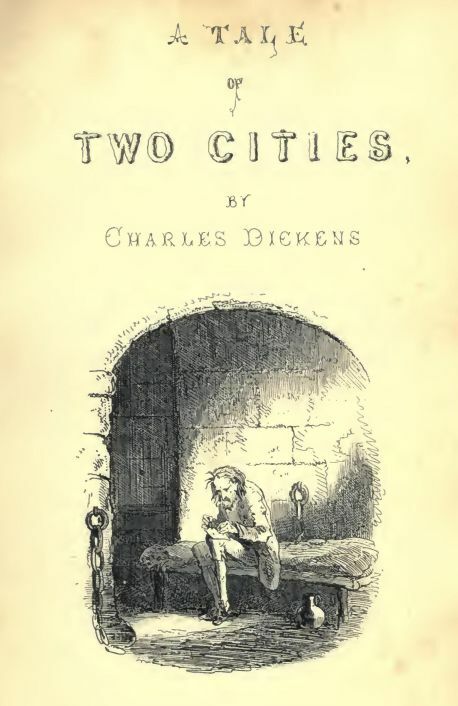 A Tale of Two Cities – A Tale of Two Cities (1859) is a novel by Charles Dickens, set in London and Paris before and during the French Revolution. The novel tells the story of the French Doctor Manette, his 18-year-long imprisonment in the Bastille in Paris and his release to life in London with his daughter Lucie, whom he had never met; Lucie’s marriage and the collision between her beloved husband and the people who caused her father’s imprisonment; and Monsieur and Madame Defarge, sellers of wine in a poor suburb of Paris. The story is set against the conditions that led up to the French Revolution and the Reign of Terror. In England, there was scarcely an amount of order and protection to justify much national boasting. Daring burglaries by armed men, and highway robberies, took place in the capital itself every night; families were publicly cautioned not to go out of town without removing their furniture to upholsterers’ warehouses for security; the highwayman in the dark was a City tradesman in the light, and, being recognised and challenged by his fellow-tradesman whom he stopped in his character of “the Captain,” gallantly shot him through the head and rode away; the mail was waylaid by seven robbers, and the guard shot three dead, and then got shot dead himself by the other four, “in consequence of the failure of his ammunition:” after which the mail was robbed in peace; that magnificent potentate, the Lord Mayor of London, was made to stand and deliver on Turnham Green, by one highwayman, who despoiled the illustrious creature in sight of all his retinue; prisoners in London gaols fought battles with their turnkeys, and the majesty of the law fired blunderbusses in among them, loaded with rounds of shot and ball; thieves snipped off diamond crosses from the necks of noble lords at Court drawing-rooms; musketeers went into St. Giles’s, to search for contraband goods, and the mob fired on the musketeers, and the musketeers fired on the mob, and nobody thought any of these occurrences much out of the common way. In the midst of them, the hangman, ever busy and ever worse than useless, was in constant requisition; now, stringing up long rows of miscellaneous criminals; now, hanging a housebreaker on Saturday who had been taken on Tuesday; now, burning people in the hand at Newgate by the dozen, and now burning pamphlets at the door of Westminster Hall; to-day, taking the life of an atrocious murderer, and to-morrow of a wretched pilferer who had robbed a farmer’s boy of sixpence. Charles Dickens was an English writer and social critic. He created some of the world’s most memorable fictional characters and is generally regarded as the greatest novelist of the Victorian period. During his life, his works enjoyed unprecedented fame, and by the twentieth century his literary genius was broadly acknowledged by critics and scholars. His novels and short stories continue to be widely popular.